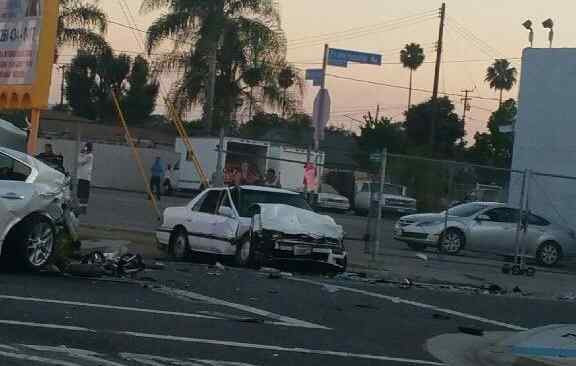 PASADENA >> Police are seeking a man who they say rammed another car while fleeing from officers on Friday. 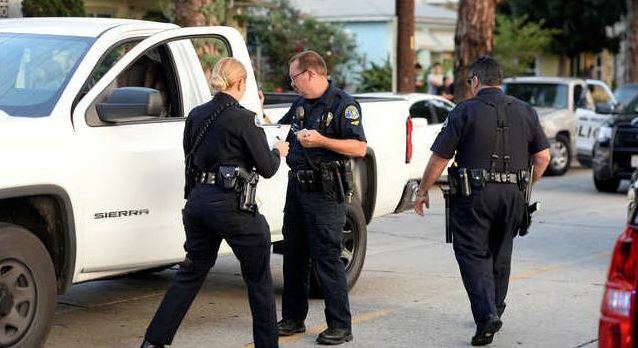 The incident began about 7:20 p.m. when an officer tried to pull over a car for a traffic violation at Lake Avenue and Boylston Street, according to Pasadena police Lt. William Grisafe. The driver fled from police, he said. He rammed another occupied car as he fled through the parking lot of a business in the 700 block of Lake Avenue in what was believed to be an intentional act. Police said the driver abandoned the crashed car and ran, leaving a woman who was riding as a passenger behind in the car. Officers searched the area but did not find the driver, Grisafe said. They did, however, recover a handgun that had been discarded in the area. A detailed description of the driver was not available as police continued working to determine his identity on Saturday. The passenger was arrested due to outstanding warrants, he added. The man driving the car struck by the fleeing suspect’s vehicle complained of pain but did not appear to suffer any serious injuries, Grisafe said. SAN GABRIEL >> Police arrested a Rosemead man, with help from a K-9, after he led them on a lengthy pursuit on Saturday morning, officials said. Leonel Cordova, 43, was expected to be booked on suspicion of evading police, resisting or obstructing officers and an outstanding warrant stemming from a drug-related case, San Gabriel police Sgt. Rebecca Gomez said. He was being treated at a hospital for dog bite wounds to his arm on Saturday afternoon before being taken to jail. The chase began after officers tried to pull over Cordova for a routine traffic violation in the area of San Gabriel Boulevard and Marshall Street, the sergeant said. Cordoza refused to pull over, initiating a pursuit. The pickup truck got into the westbound 10 Freeway, then the southbound 710 Freeway, Gomez said. The driver briefly stopped at the 3rd Street offramp of the 710 Freeway, but then accelerated away and resumed the chase. Cordova ultimately made his way to the Calvary Cemetery, 4201 Whittier Blvd. in Los Angeles, according to Gomez. He exited his car, but refused numerous police orders to surrender, both in English and in Spanish. Officers ultimately used a police K-9 to subdue Cordova before taking him into custody, she said. The pickup truck is registered to Cordova, Gomez said. Police planned to have a blood sample examined to determine whether he was under the influence of any substances. A man led deputies on a chase from West Whittier to South El Monte in a carjacked car before being captured by a sheriff’s SWAT team on Sunday morning, officials said. Robert Larry Gutierrez, 34, was jailed following the pursuit, which began about 7:30 a.m., Los Angeles County sheriff’s Lt. Alex Villanueva said. His hometown was not available. Deputies patrolling over the unincorporated county area of West Whittier in a helicopter detected a signal from a LoJack vehicle tracker in the area of Washington and Norwalk boulevards, the lieutenant said. The vehicle had been reported carjacked in South Gate earlier in the morning. “It looked like he was going to pull over initially, but then he took off,” Villanueva said. Gutierrez led deputies on a 6-mile chase that ended when he abandoned his car along Peck Road at the 60 Freeway in South El Monte and fled into a nearby brush area, according to Villanueva. Deputies summoned a sheriff’s Special Enforcement Bureau SWAT Team to track down the suspect in the dense vegetation. A sheriff’s helicopter landed on the freeway in order to rush deputies to the scene. The SWAT deputies, aided by a K-9, soon found Gutierrez hiding in the brush and took him into custody. He was being booked on suspicion of driving a car without the owner’s consent, felony evading and possession of cocaine, Villanueva said. The earlier carjacking was being investigated by the South Gate Police Department. 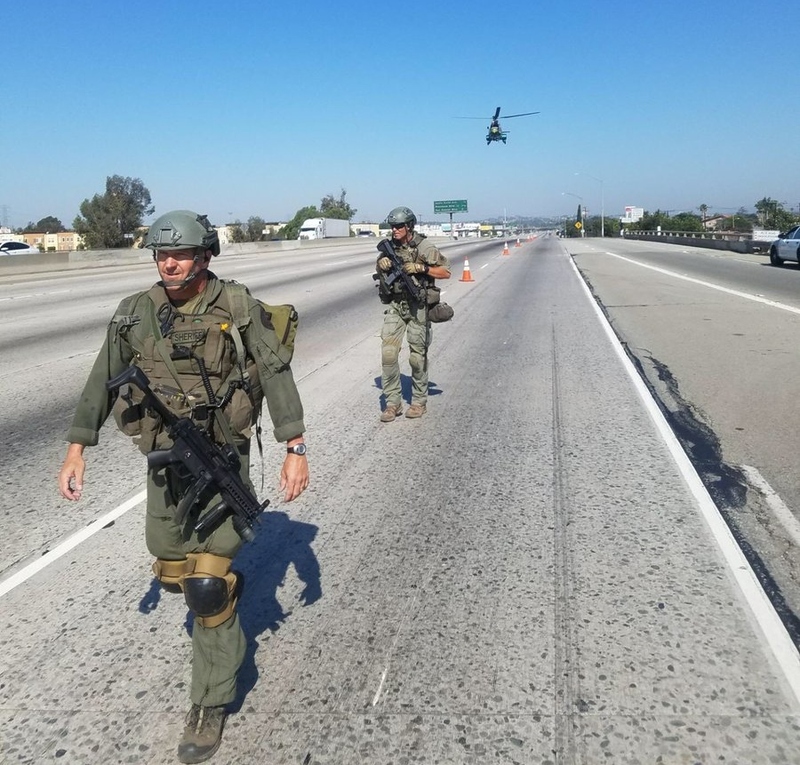 The westbound lanes of the 60 Freeway were closed down for nearly half-an-hour as deputies searched for and apprehended the suspect. PASADENA >> A man in a hybrid car led police on a reckless but fuel efficient chase in Pasadena before being arrested early Wednesday, officials said. The incident began about 4:10 a.m. when officers spotted a Toyota Prius run a red light at Lake Avenue and Colorado Boulevard and tried to pull it over, according to Pasadena police Lt. Mark Goodman said. “The suspect failed to yield and a short vehicle pursuit ensued during which the suspect ran a red signal and disregarded traffic laws,” Goodman said in a written statement. Hector Maya, 27, of Los Angeles was booked on suspicion of felony evading and driving on a suspended license, Goodman said. The brief pursuit lasted less than two minutes and covered just over a mile of distance, Goodman added. No injuries or property damage were reported. According to county booking records, Maya was being held in lieu of $75,000 bail pending his initial court appearance at the Pasadena City Jail. A La Mirada man stole a GPS-laden “bait package” in Arcadia before leading police on a lengthy pursuit in a stolen car, then trying to hide inside a South Gate movie theater before being taken into custody on Thursday, authorities said. Christopher Cook, 27, was ultimately arrested on suspicion of grand theft, auto theft and evading police following the incident, which began about 6:40 p.m.
“Arcadia police officers were dispatched to the 1600 block of Holly Avenue on a GPS package theft activation,” Arcadia police Lt. Vaughn Whalen said in a written statement. Arcadia police regularly set out packages and bicycles equipped with GPS trackers to bust opportunistic thieves. Police tracked the package to a parking lot in Hacienda Heights, where the suspect fled from officers in a Hyundai Sonata which was later determined to have been reported stolen, Whalen said. Arcadia police soon cancelled the pursuit due to safety concerns, officials said. The fleeing car was speeding through red lights, and at times on the wrong side of the road, according to police radio traffic. 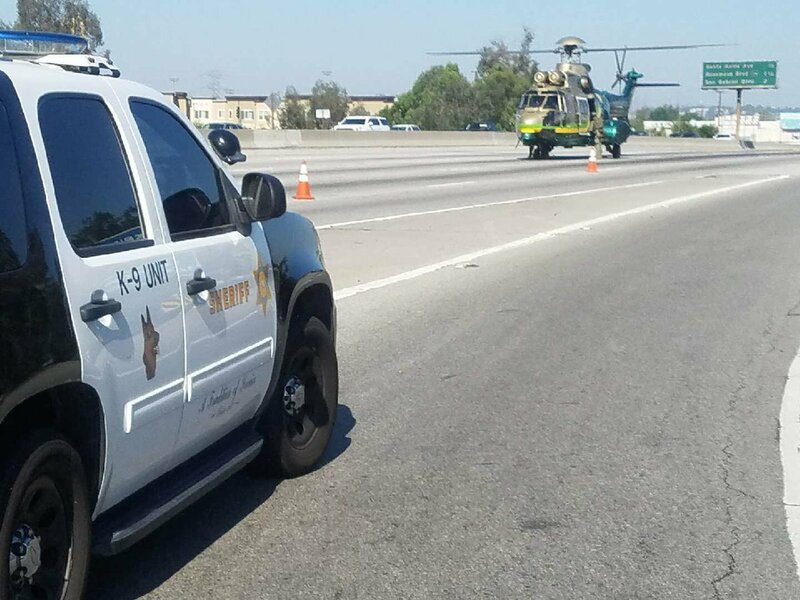 But officials continued following the suspect via helicopter, and California Highway Patrol officers resumed the chase on the westbound 60 Freeway. The pursuit headed down the 60, 710 and 5 freeways before the suspect ditched his car in a parking structure near Garfield Avenue and Firestone Boulevard in South Gate and ran into a nearby movie theater as television news cameras broadcast live. “Arcadia officers arrived at that location and with the assistance of multiple agencies, took the suspect into custody without incident,” Whalen said. Officers could be seen in helicopter news footage escorting Cook from the theater in handcuffs about 9 p.m.
BOOKING PHOTO of Christopher Cook, 27, of La Mirada courtesy of the Arcadia Police Department. WHITTIER >> A robbery suspect led police on a high-speed chase through several cities that began and ended in Whittier late Wednesday, officials said. The incident began about 5:50 p.m. when Whittier police received a report that a witness had spotted a suspicious person at Whittier Boulevard and Broadway who may have been connected to a prior crime reported to the neighboring sheriff’s Pico Rivera Station, Whittier police Lt. Aaron Ruiz said. As police approached the white GMC pickup truck, it fled from officers, initiating a pursuit. The pickup truck traveled at high speeds, and at some points on the wrong side of the road, under the helicopter-mounted cameras of local TV news helicopters as it made its way north to Hacienda Heights via surface streets, then back into Whittier. A dispatcher reportedly made contact with the suspect by phone before he stopped the truck and surrendered along Pickering Avenue, just south of Mar Vista Street. The driver was taken into custody without a struggle. A passenger was initially inside the truck with the driver when the chase began, Ruiz said. He exited the car toward the outset of the chase and cooperated with police. He was not arrested. The driver was expected to be booked on suspicion of evading police and driving on a suspended license, Ruiz said. His identity was not available pending the booking process. Detectives in Pico Rivera were looking the man’s suspected connection with a robbery reported in their jurisdiction, sheriff’s officials said. Further details regarding the robbery case were not available Wednesday night. LA HABRA >> Police arrested one man and sought two more after they burglarized a La Habra cell phone store, then led police on a chase that ended in Montebello early Saturday, authorities said. The incident began about 3:20 a.m. when a security alarm company notified police of a break-in at a Sprint store in the 1300 block of South Beach Boulevard, La Habra police Sgt. Rob Diehl said. The alarm company reported that the burglars were still inside the store, based on remotely viewed surveillance cameras, police added. The SUV, later determined to be a rental car, led police on a high-speed chase on surface streets and freeways through Orange and Los Angeles counties, the sergeant said. It ultimately came to a stop along the 605 Freeway in Montebello, where all three suspects ran from the SUV. Officers captured one of the passenger, but the driver and second passenger were no found, Diehl said. Police recovered dozens of cell phones, primarily iPhones, from the suspects’ SUV, he said. The identity of the suspect who was in custody was not released Saturday as officials continued seeking his alleged accomplices, Diel said. ARCADIA >> A stolen car investigation led police to discover 600 marijuana plants growing inside an Arcadia home and arrest two suspects on Friday, officials said. The series of events began about 10:30 a.m., when officers spotted a stolen car parked in the 200 block of West Palm Avenue, according to Arcadia police Lt. Roy Nakamura. Police watched the car until a man exited a nearby home, got into the car and drove off, the lieutenant said. Officers tried to pull the driver over, but he fled, initiating a chase. Police briefly pursued the car before cancelling the chase due to safety concerns, Nakamura said. Officials soon found the stolen car abandoned in the 2000 block of St. James Drive in Temple City, but the driver remained at large. As officers continued their investigation back at the home from which the suspect emerged, they found “an active marijuana grow operation involving approximately 600 plants,” according to Nakamura. Two men at the home, identified as Ian Woodworth, 38, of Denver, Colorado and Wayne Chong, 49, of North Hollywood, were arrested on suspicion of cultivating marijuana, according to police and county booking records. Chong was free on a $50,000 bond at the time of his arrest, according to county booking records. Police in Arcadia arrested him Feb. 22 on suspicion of false impersonation of another, using a driver’s license to commit gforgery, possession of a document with a forged government seal and driving on a suspended license. He posted bail the same day he was arrested. Charges were yet to be filed when he again found himself in handcuffs on Friday. “At this time, it appears the cultivation is connected to the stolen vehicle,” Nakamura added. Anyone with information is encouraged to contact Arcadia police at 626-574-5151. Tips may also be submitted anonymously to L.A. Regional Crime Stoppers at 800-222-8477. AZUSA >> A wanted Azusa man remained behind bars in lieu of more than half a million dollars bail on Wednesday after leading police on a pursuit in a stolen car earlier in the week, authorities said. Ricardo Angel Guzman, 36, was booked on suspicion of possession of a stolen car, evading police, drug possession and driving on a suspended license following the chase, which took place just after 9:30 p.m. on Monday, Azusa police Lt. Michael Bertelsen said. He also had three outstanding arrest warrants. The incident began when someone called police from a residential neighborhood in town to report seeing a suspicious vehicle, the lieutenant said. The driver, later identified as Guzman, led officers on a chase through city streets for about 20 minutes, according to Bertelsen. A woman was riding in the car as a passenger. Officers soon determined the car had recently been reported stolen in Ontario, he added. At one point, the car ran into a dead end on Kirkwall Road. But the driver drove through the adjacent Valleydale Park, 5525 N. Lark Ellen Ave., and continued the pursuit, Bertelsen said. The car also briefly sped toward an officer as he was sitting in a patrol car blocking traffic. The car ultimately came to a stop in the 300 block of South Louise Avenue, where the Guzman exited the car and ran, but was soon apprehended, according to the lieutenant. The female passenger was detained at the scene and treated for an existing medical condition, but was not arrested. Guzman was booked into the Azusa Police Department’s jail, where he was being held in lieu of $620,000 bail pending his initial court appearance, scheduled Thursday in West Covina branch of Los Angeles County Superior Court.